Bread is highly esteemed by Asian people. Children in Asia are taught to revere bread from early childhood. 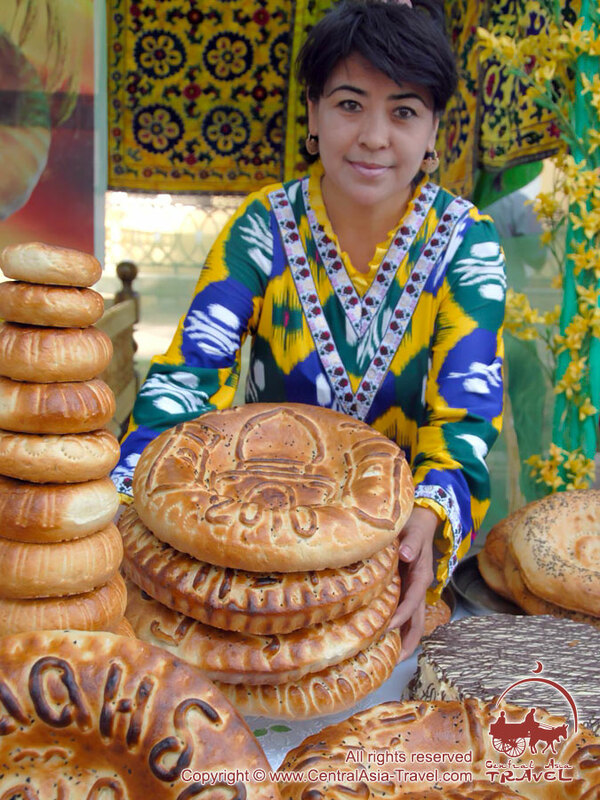 In Uzbekistan there are a lot of rites and rituals connected with traditional Uzbek breads (locals call it non, patir or lepeshka in Russian). 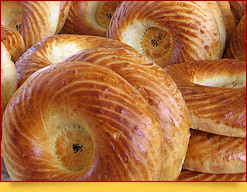 For instance, a person setting off on a long travel must eat a small piece of bread, while the rest of the loaf is kept until he returns. 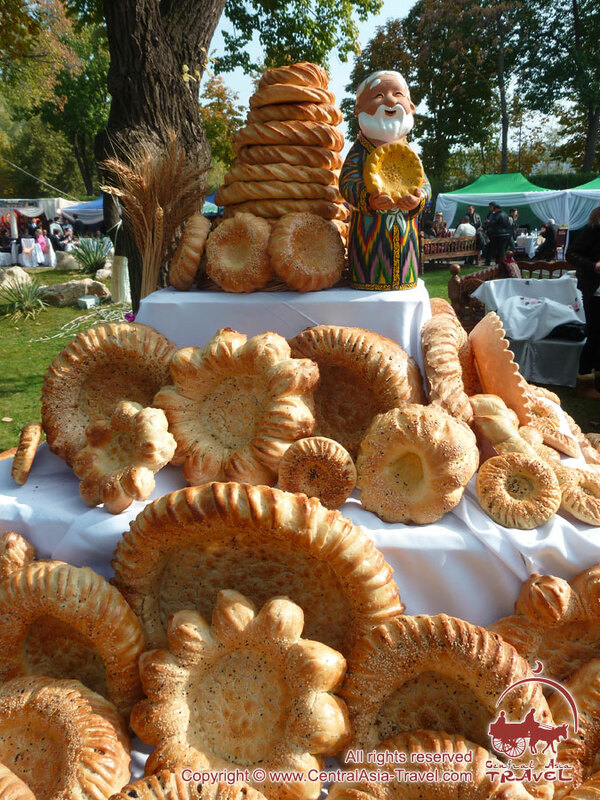 There is an engagement ritual of ‘breaking of bread’ (it cannot be cut as, according to a belief, the knife may hurt the bread), which is performed to confirm an agreement between parents upon a marriage between their children. 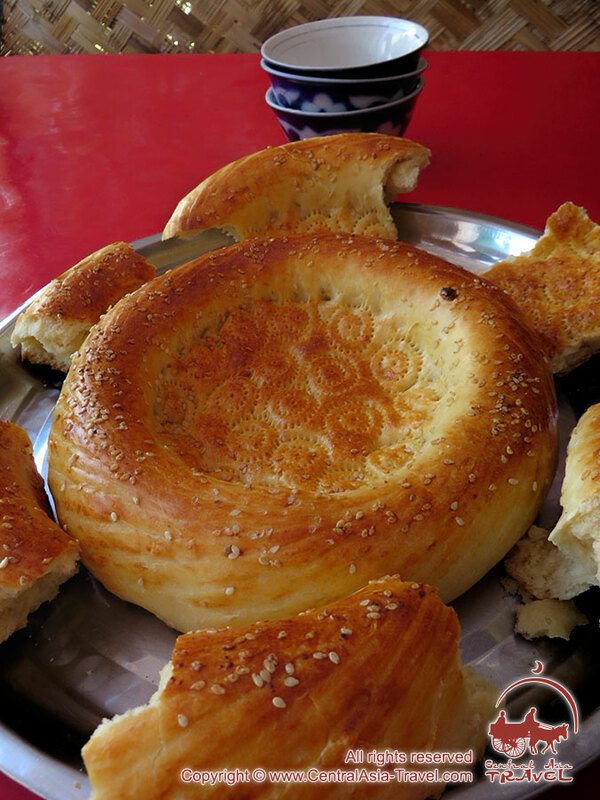 The most serious vows are also spoken on bread, as for Asians there is nothing worse in the world than to break such a vow. 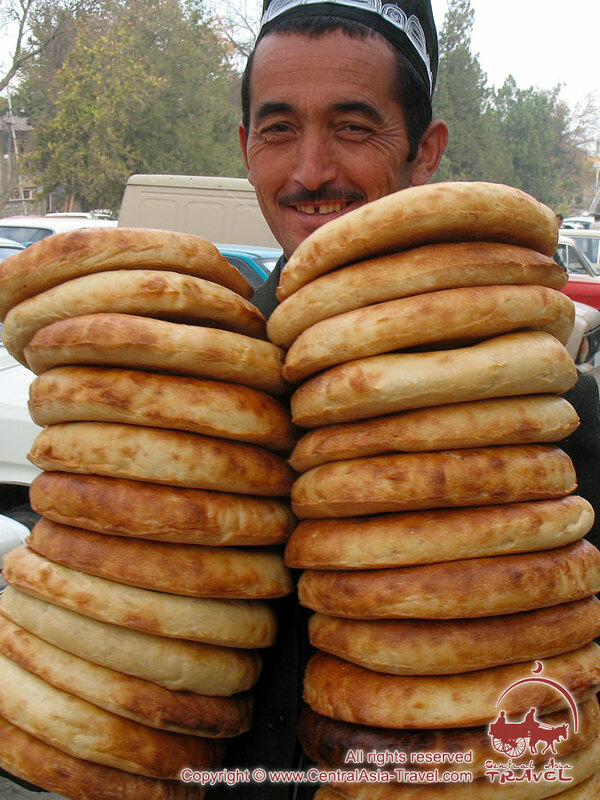 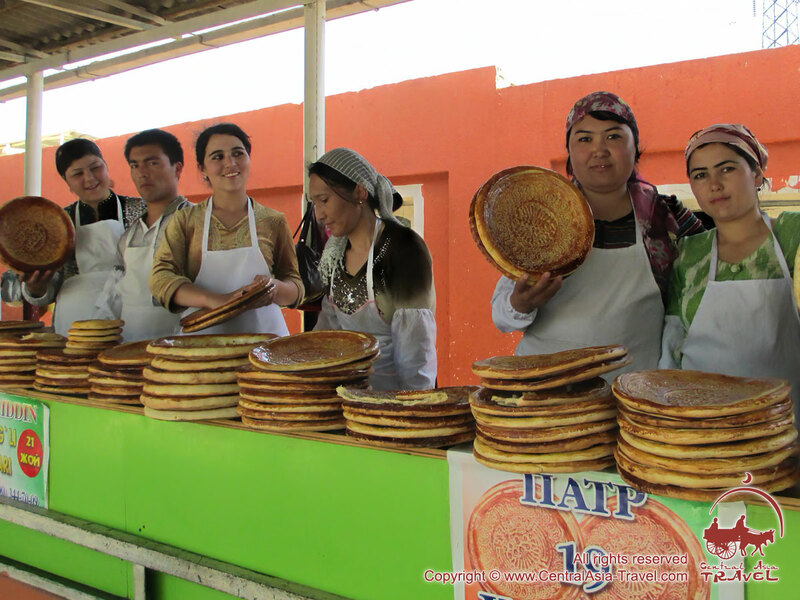 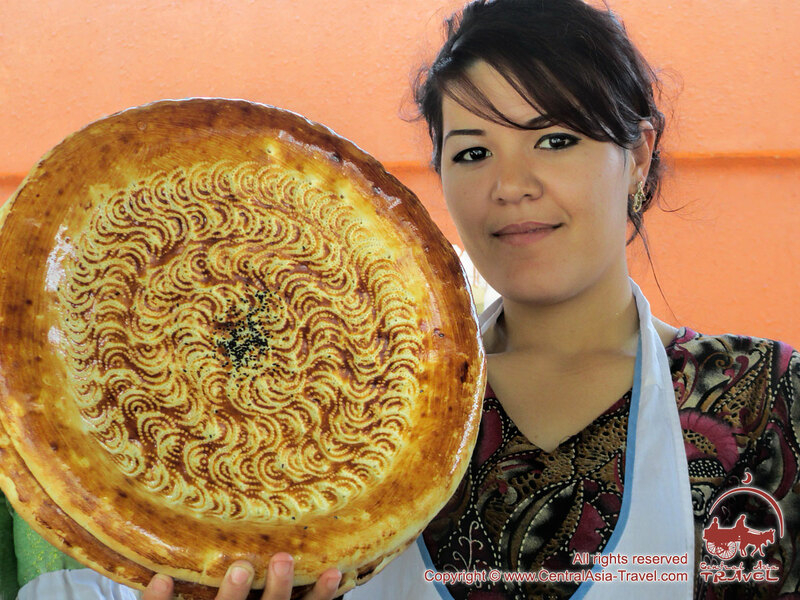 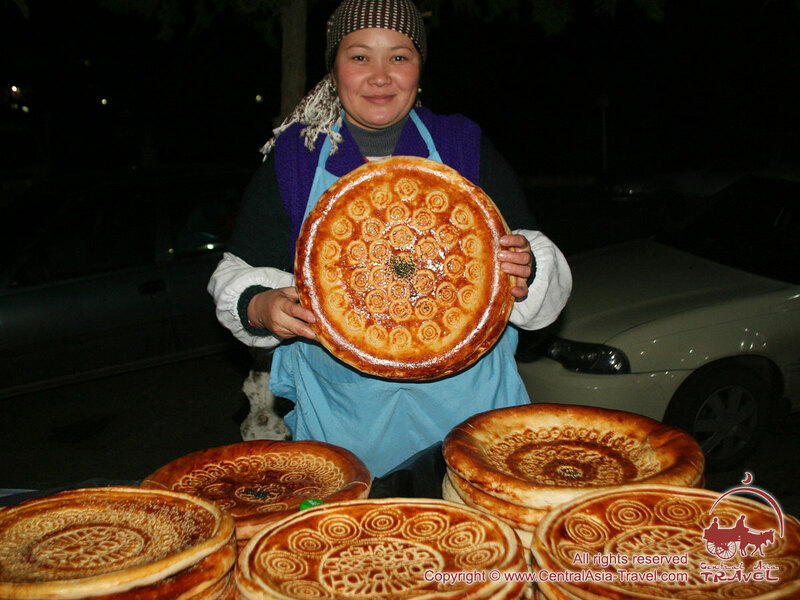 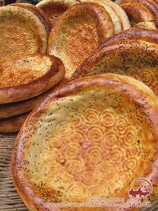 Uzbek bread is baked in the form of circular flat loaves with a thin decorated crispy centre and puffy edges. 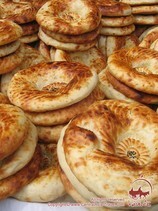 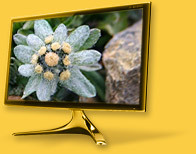 Non in Uzbekistan is often eaten for dinner or supper with mere fruit or sweet green tea. 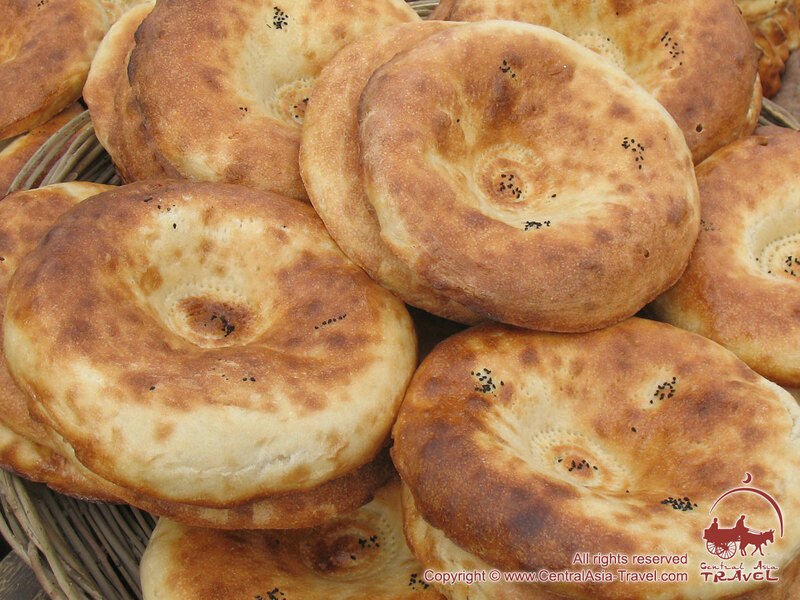 There are many other sorts of bread, such as simple bread, bread with crackling, bread with meat, bread from bran, puffy bread, flaky bread, bread fried in oil with onion and so on. 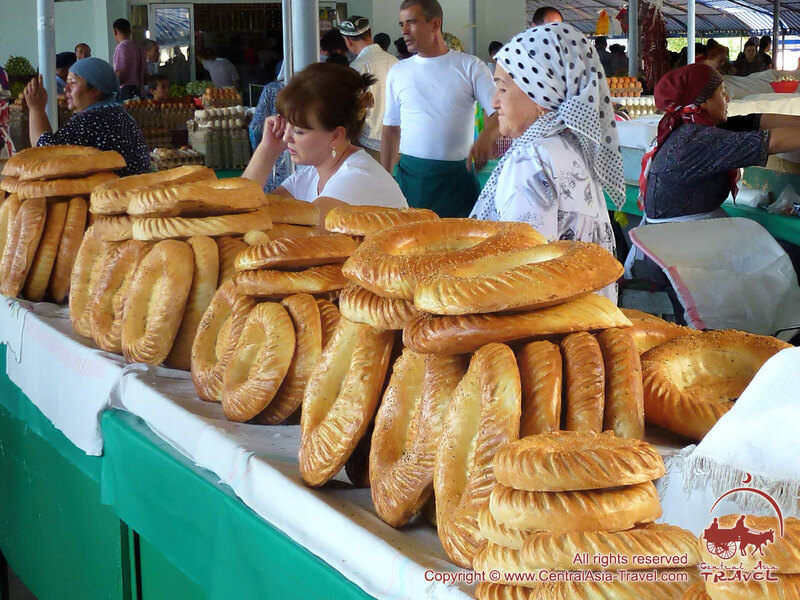 In every city and town, at a market, you can see long rows of various kinds of bread decoratively disposed on the stalls. Uzbek bread is made of simple or fat dough, sometimes with the addition of milk, sour cream, eggs and even herbs. 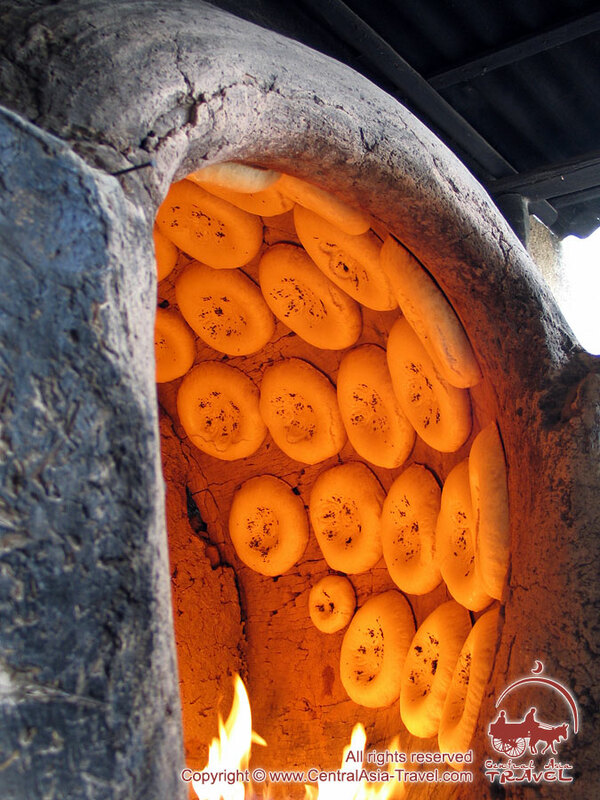 In former times it was not yeast that was used for fermentation, but the remains of dough from a previous batch of bread. 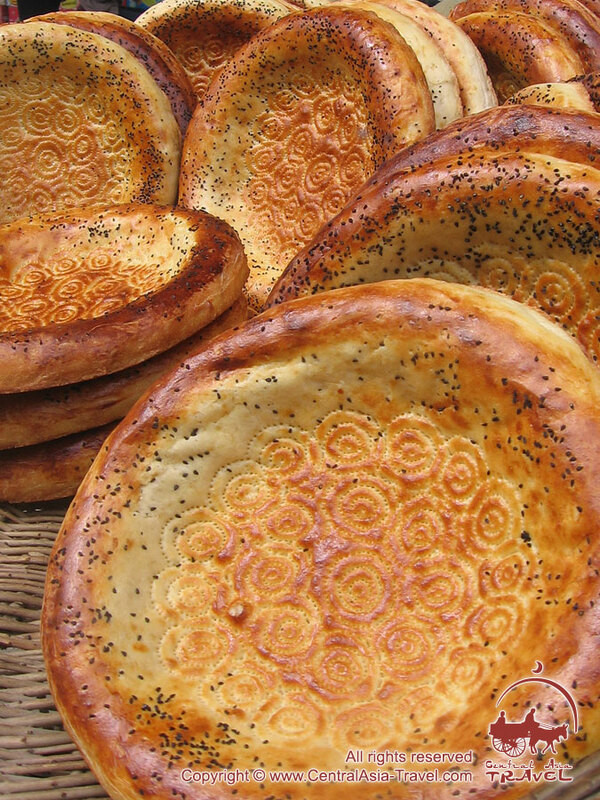 Usually, classic Uzbek bread is baked in a tandir oven (traditional Central Asian clay oven; also spelled tandyr, tandoor); however, there are some sorts that are made in different ways. 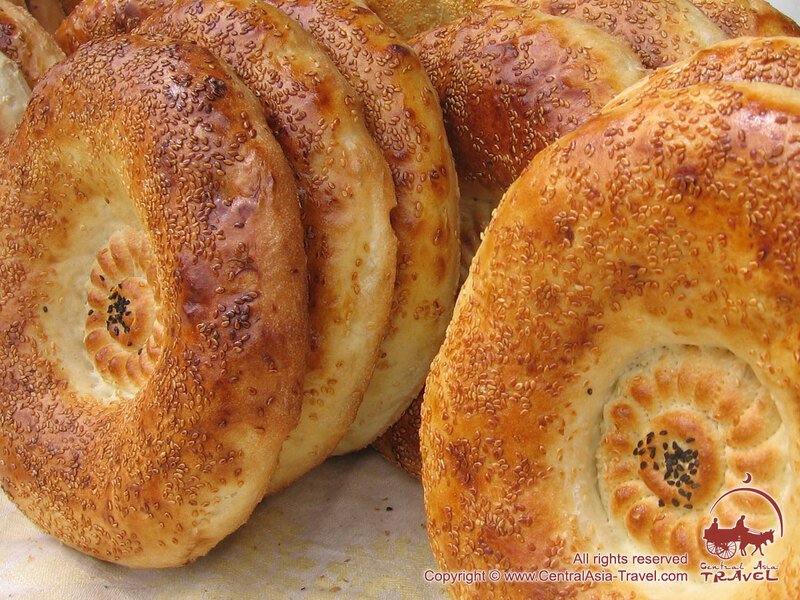 Thus, flaky non of a certain type is made in the following manner. 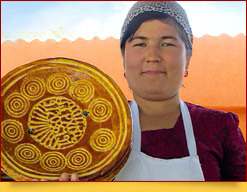 A thin and broad piece of simple dough is smeared with oil or sour cream, covered with sliced onion and rolled up. 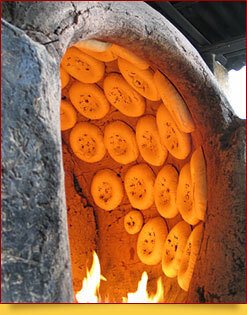 The roll is then cut into flat rounds, which are formed into loaves and fried in a cauldron. 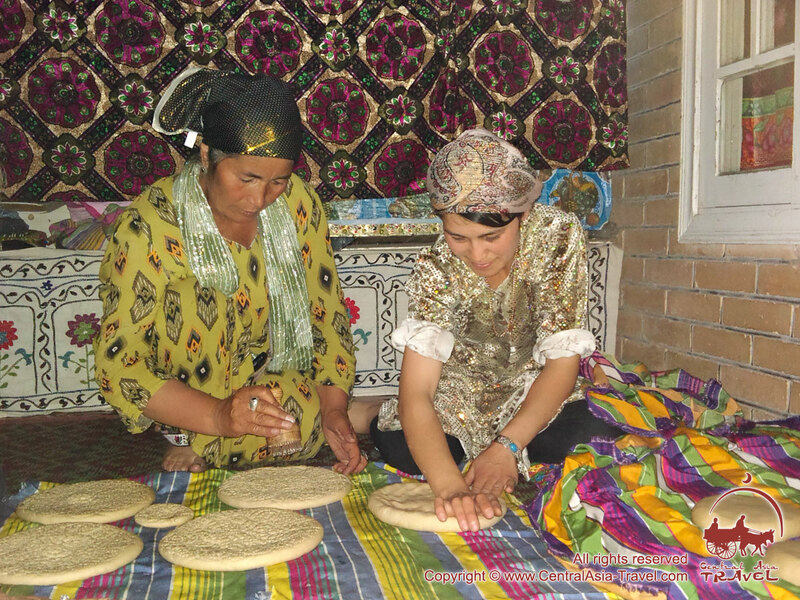 Usually, only men are involved in baking traditional bread. It is very interesting to see how the bread is made in the bakery. 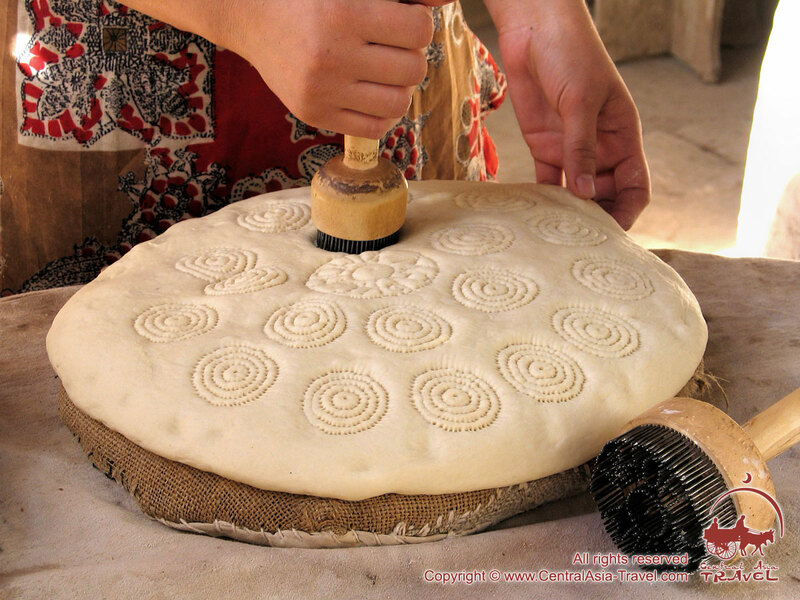 To make the process easier and more rapid, each person is engaged in a certain type of activity: one makes balls of dough, another forms loaves from these balls and provides them with twisted ornament on the sides and a pattern of holes in the centre with the help of a chakich, a special pestle with sharp teeth, while the third dives into the heated oven, sticks the bread to the wall of the tandir and comes out for the next loaf. 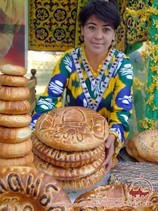 The Uzbek bread is sometimes used as a plate, to serve fruit or meat. 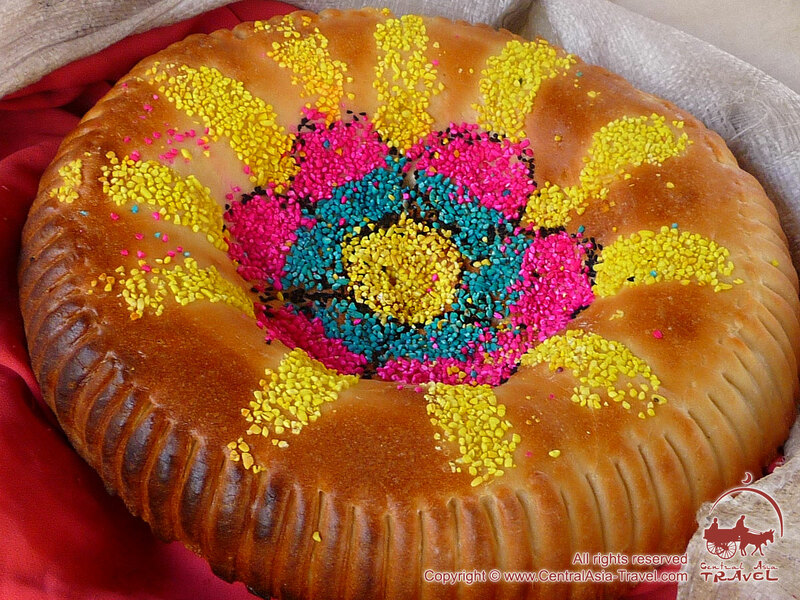 Today the traditional Uzbek bread is often decorated, specially for tourists, with inscriptions and coloured sesame seeds.